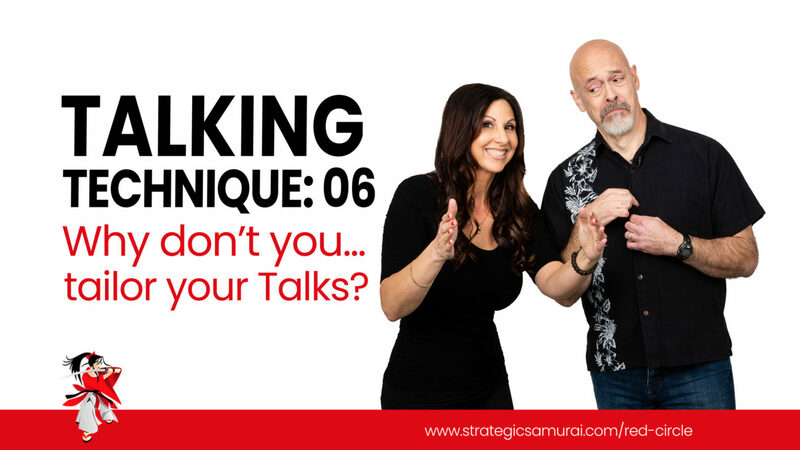 Talking Technique Ep 06: Why don't you... tailor your talk to your audience? We all have our signature Talk, our go-to Talk that we can give in a moment’s notice. Don’t allow this talk to become so automatic that you deliver it in exactly the same way every time. Make sure you use variety in every Talk. You’ll always want to find out as much as you can about the audience when preparing your performance. Depending on the audience you are speaking to, you may need to alter jokes, references, also developments in the story to more thoroughly engage your audience. Kymberlee: This week we are talking technique. Kymberlee: Tailor your talk to your audience. So many times, as speakers, we have a particular talk that we're very comfortable giving and it's our go-to talk, and no matter where we are speaking, the talk is exactly the same. So many speakers make that mistake. Alan: Yeah, it's important to memorize your talk. It's more important to also be comfortable with your material so when the audience changes, you can alter either your delivery or some of the talking points, maybe even the order, depending on the audience you're talking to. And always, especially with a small audience, be sensitive to what they want from you so that you can respond to querying looks or somebody who may have a question in the middle of the talk. A small audience is very different than a very large audience. Kymberlee: And what you can do is, before you even hit the ground to deliver the talk that you're about to deliver, ask whomever hired you who the audience is. The person who hired you would love to tell you all about their audience, because that will allow you to position your talk differently. Maybe the lessons shift a little bit, maybe the stories that you pull out, that you tell, change them so that you're really speaking to that group that you're in front of. Alan: An extreme example of that, I do a lot of technical talks. I radically change the talk depending on whether I'm speaking to other technical folk, people who understand the details and I can get into that, or if I'm trying to sell to more of a management crew who need to know the results and the impact of what I'm talking about. Then my talk will change and I will focus on those aspects. The overall talk can cover all of those things, but I can alter it depending on my audience. Kymberlee: And it might be that you just shift your opening story, for example. It may be to make sure that the crowd that you're in front of can really get the most out of you and your talk. And this will allow you to build trust with them very, very fast because you're speaking their language. I know, for me, if I'm going to go do a keynote, I'm going to do my research. I'm going to know if I'm speaking to HR professionals, it's going to be very different than if I'm speaking to people in the steel industry, for example. Whoever is in my audience, I want to know that and I'm going to bring in the little asides or the little jokes or the little insights that are very specific to them. Alan: If you are speaking to a technical audience or more of a professional audience, you will need to alter jokes, references, also developments in the story just to more thoroughly engage your audience. That's the goal here, right? We want to engage our audience and make sure they're both paying attention and learning from what we have to talk about. Kymberlee: And when you do, they will follow you anywhere. You will establish that trust that I talked about and you will establish this bond and this openness to learning. Alan: Tailor your talk to your audience.